Late Season Greenland Melt Pulse Continues. 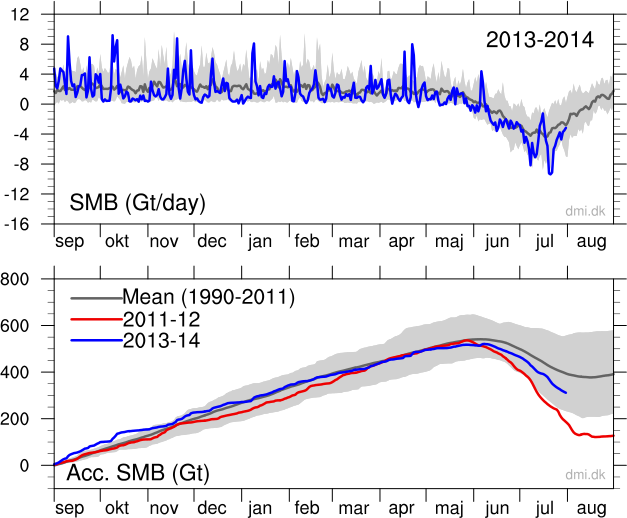 A strong, late-season melt pulse continued over the Greenland ice sheet this weekend as melt covered a much greater portion of the ice sheet than is typical for this time of year. 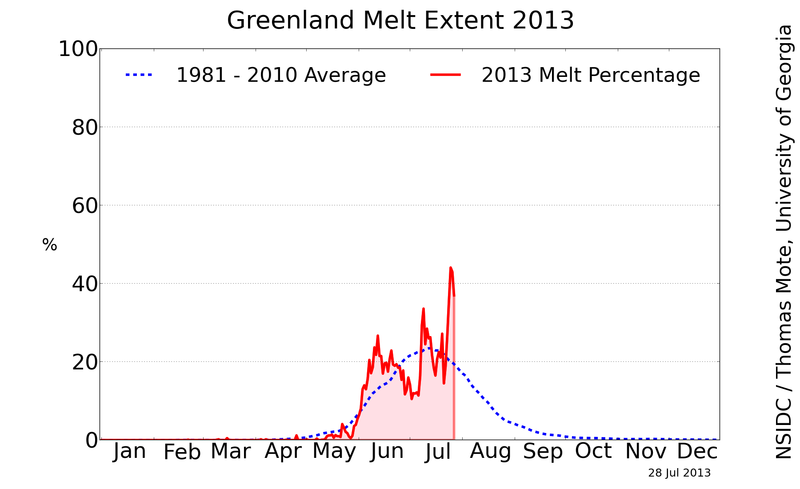 As of late July, the area of the Greenland ice sheet subject to melt had spiked to nearly 45%. Soon after, a second melt spike to around 38% followed. Over the past two weeks, melt area coverage has fluctuated between 5 and 25 percentage points above the seasonal average for this time of year, maintaining at or above the typical melt season maximum of around 25% for almost all of this time. 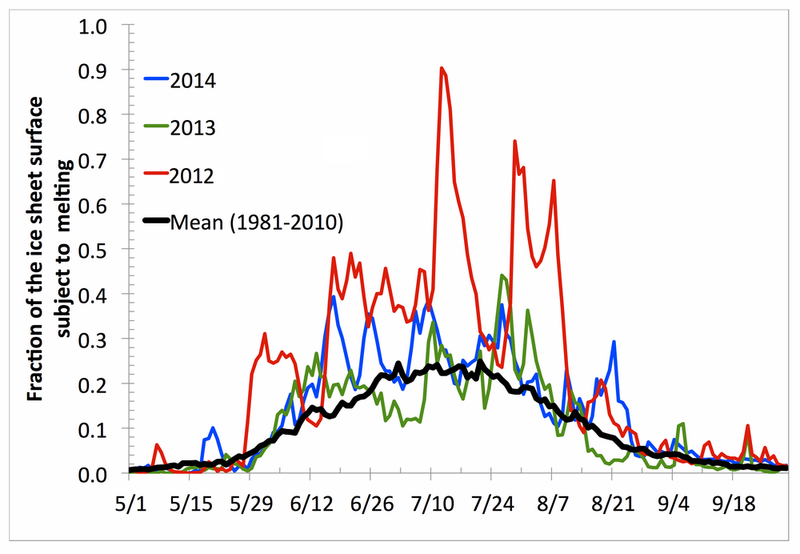 This late-season melt surge was driven by a switch in the polar Jet Stream. 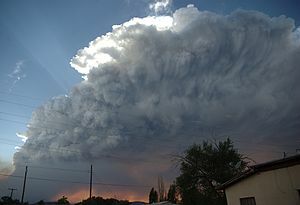 A trough which had dominated through much of summer, bringing near average temperatures and melt conditions, had eroded and by late July a broad ridge began to form. This high amplitude wave dredged warm air up from as far south as the south-eastern US, then dumped it on the west facing coast of Greenland. 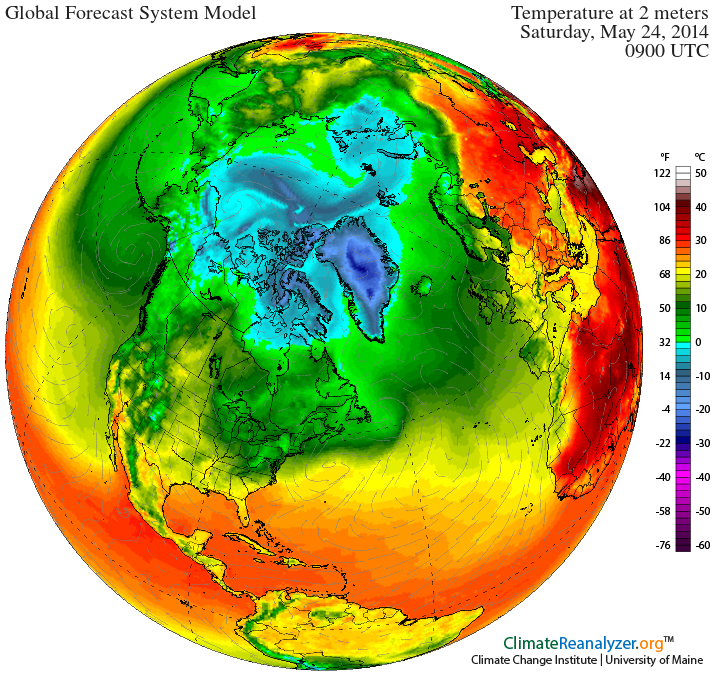 There, last week, a new record all time high temperature of 78.6 degrees (Fahrenheit) shattered Greenland’s previous highest temperature of 77.9 degrees. And this record heat is beginning to have a very visible affect on the ice. 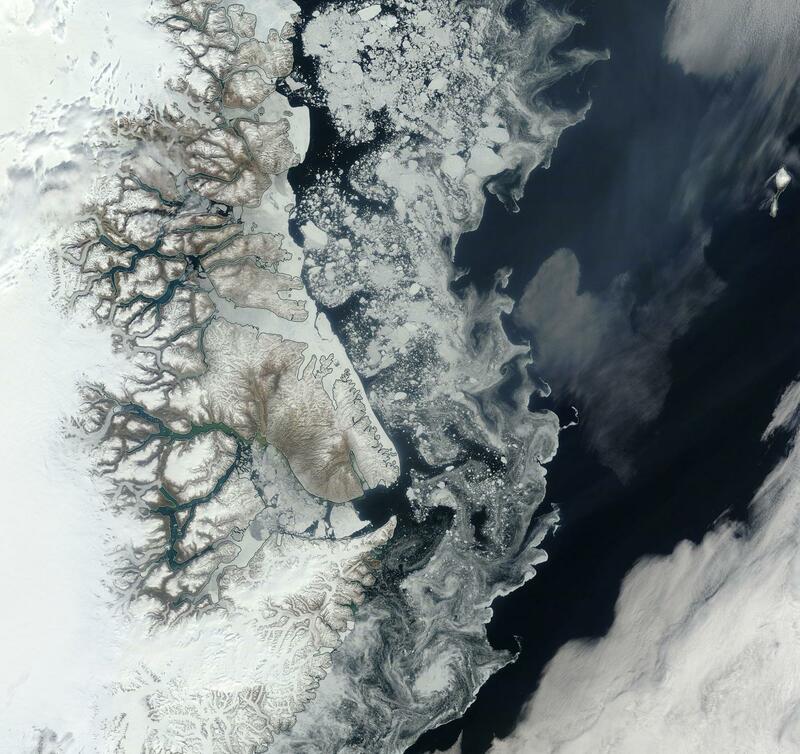 Aqua satellite passes this weekend recorded a visible darkening of ice cover in the region most greatly impacted by high temperatures last week. The snow and ice cover there has taken on a sooty appearance with darker gray tendrils finding their way deep into the ice pack. 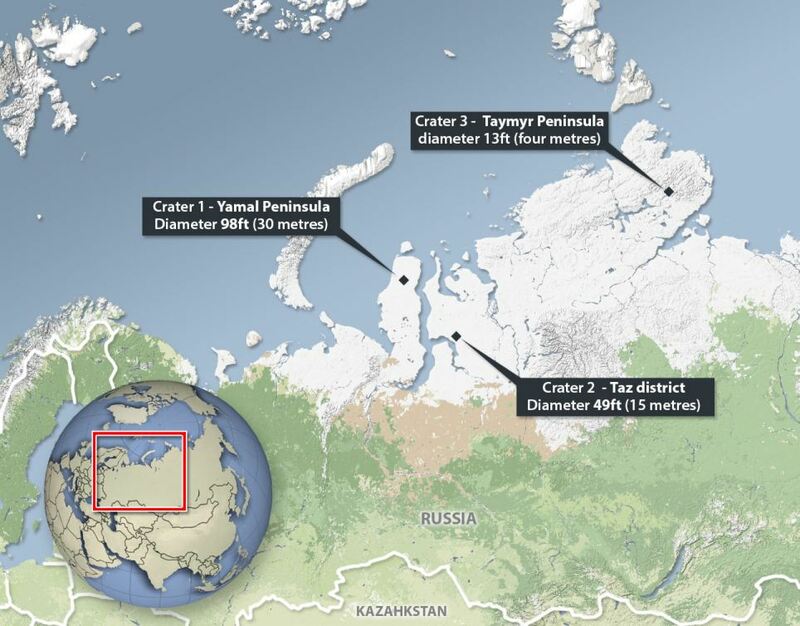 At the same time, large melt lakes expanded over the region with some of these lakes measuring more than three kilometers across. 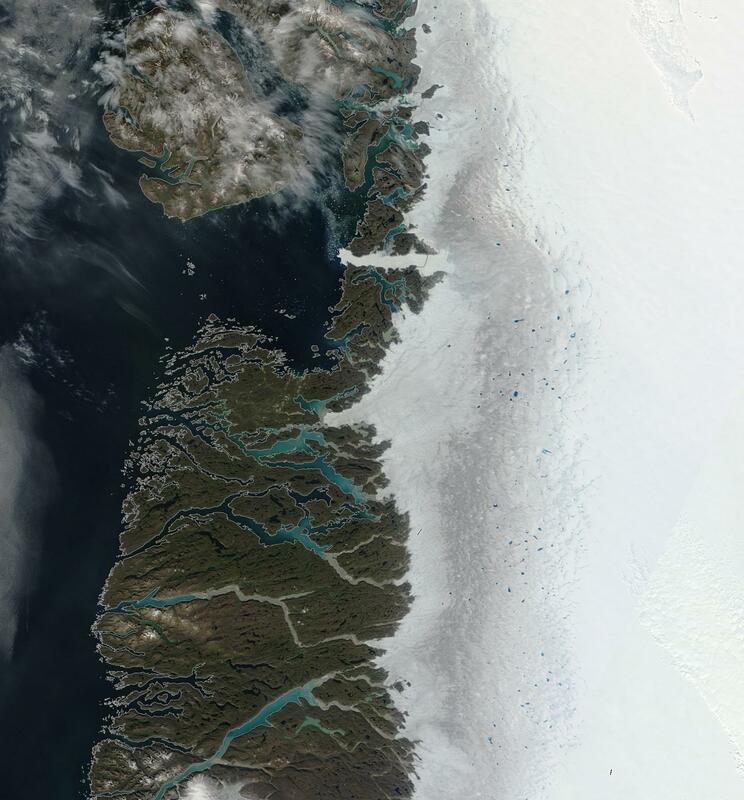 Greenland west coast melt, August 4. 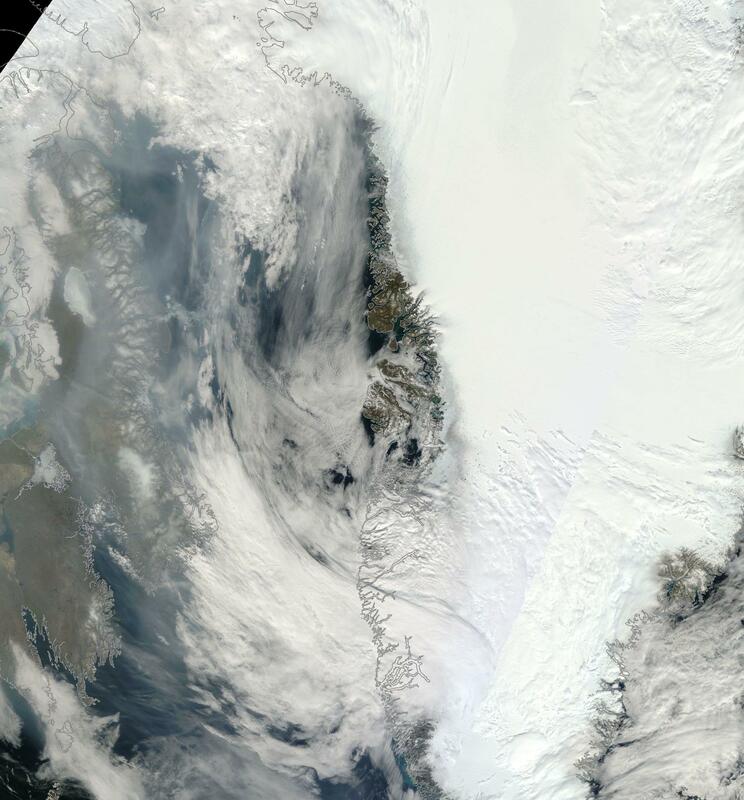 For reference, Baffin Bay is toward the left of the image, the southern tip of Greenland, toward the bottom, and the far right frame of the image runs about down the center-line of the south Greenland ice spur. 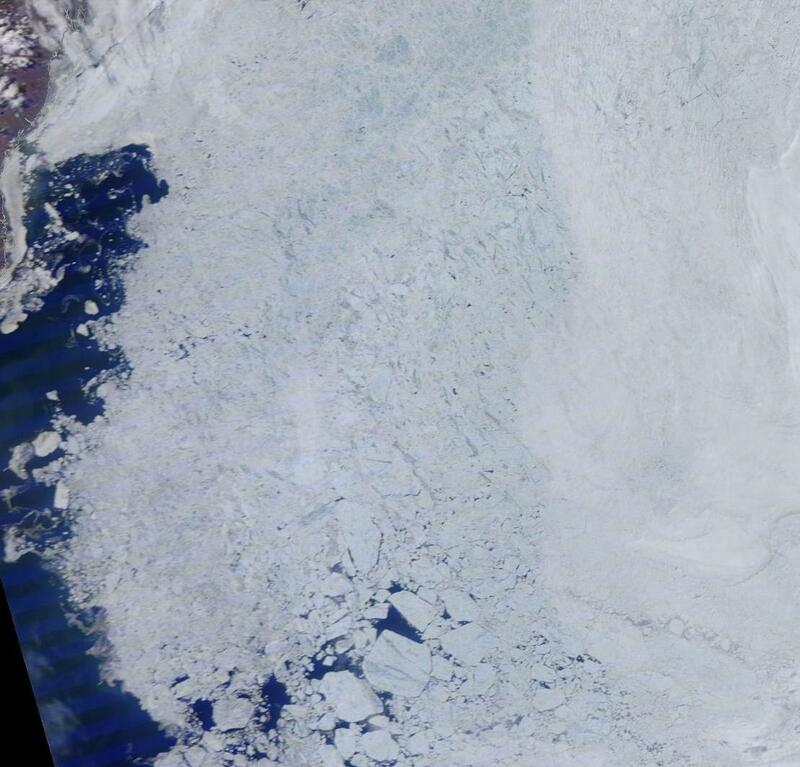 Note the swatch of dark ice that appears much like dirty snow running down western side of the ice sheet. 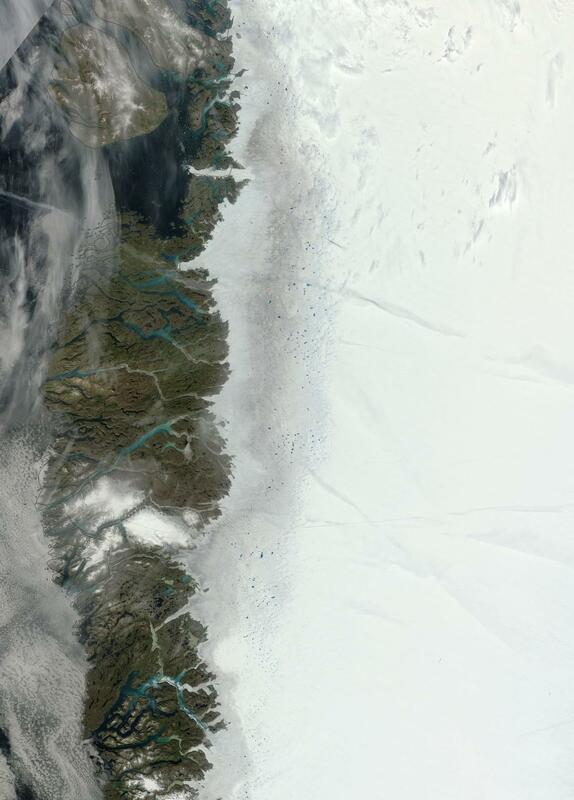 This major melt region, at its widest, appears to dive as much as 100 miles into the ice sheet. 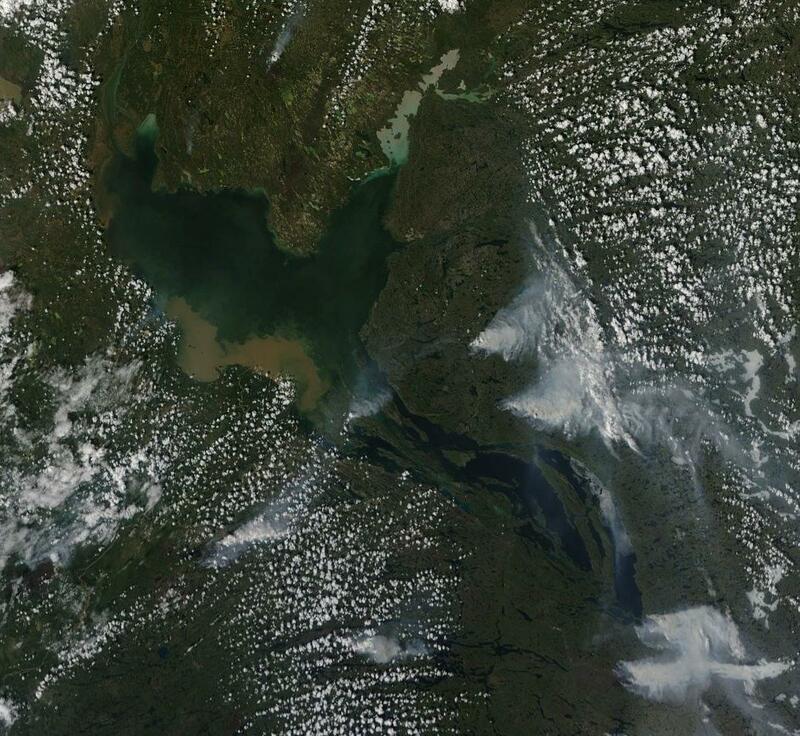 Even at this level of resolution, we can see the large melt lakes speckling the inland border of this darkened region. Zooming in to a region where melt appears to have penetrated deepest into the ice pack, we find even more dramatic features. 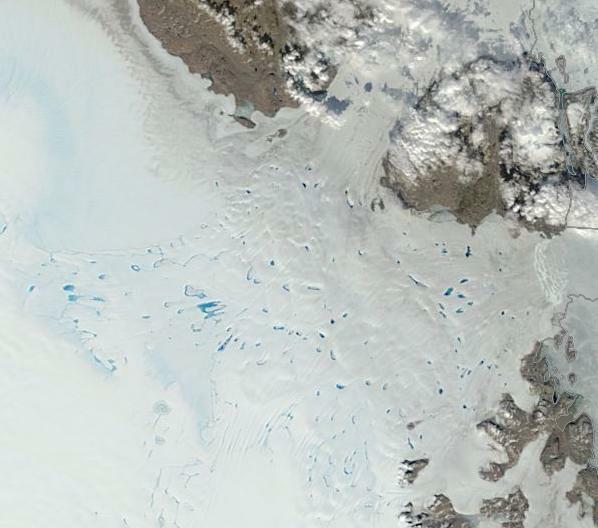 Greenland melt lakes, dark snow, August 4, 2013. The orientation of this particular image is the same as the larger image above, but we have just zoomed in to a large, central melt region. 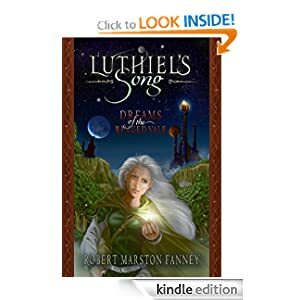 Toward the coast, we can see melt and ice flowing into channels and fjords. Adjacent to this rocky coastal zone is a region of more rapidly mobile and fractured ice flows. 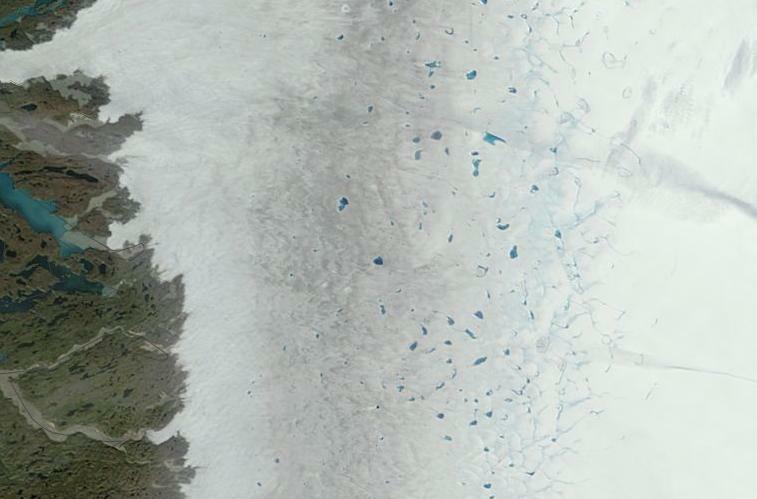 Few melt ponds are visible in this region and this is, likely, due to the large fissures and steep vertical faces that cover most of the ice surface in this area. It is beyond this boundary margin and inward toward the ice sheet’s center that we find a second region of very dark snow and ice. This area shows some large melt ponds, but its prominent feature is an almost complete loss of reflective snow cover with lower layers of soot deposition and darker sediment now exposed. 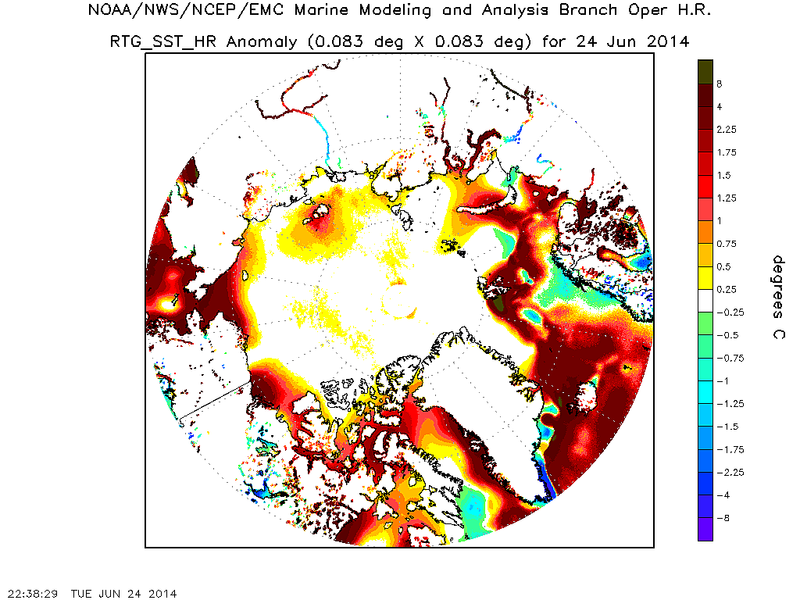 Still further in, we find the third, and arguably most dramatic, melt zone. This particular area is coated, not in dark gray, but in blue. 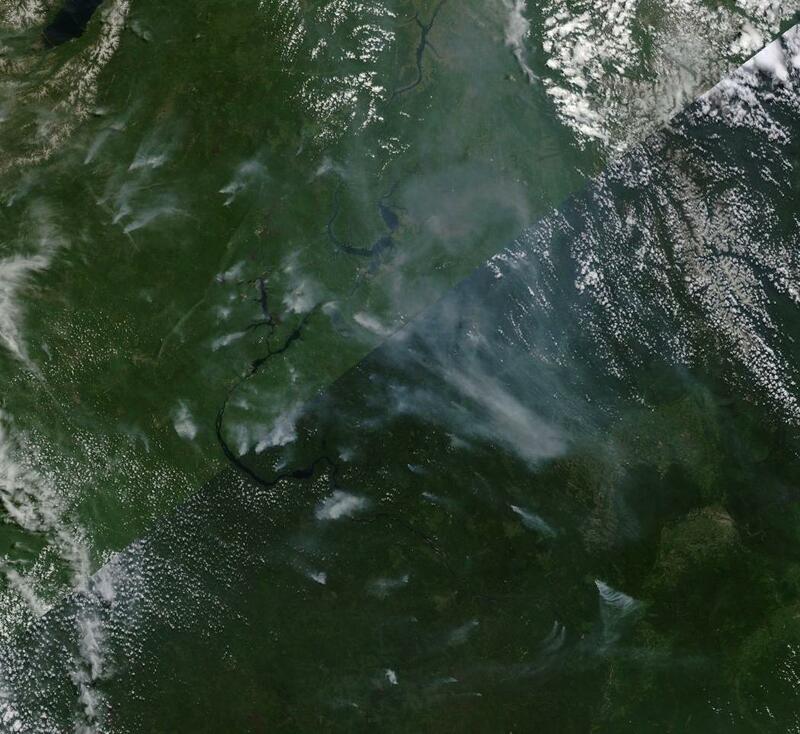 It is a feature primarily caused by a very extensive surface melt covering much of this region. 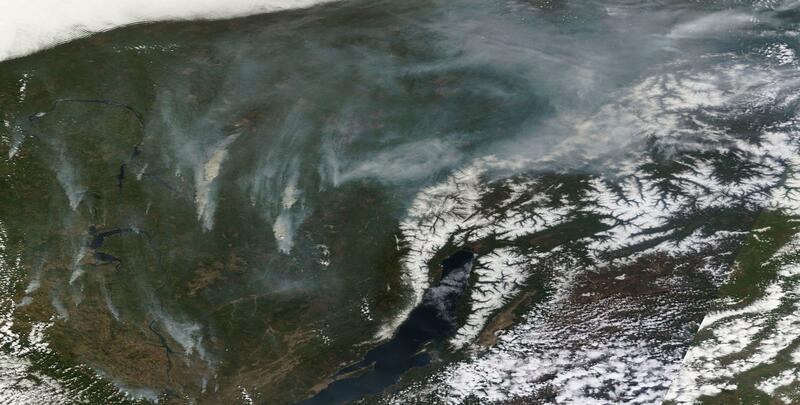 In this single picture, we can count over a hundred large melt lakes mostly dominating this region. They range in size from about a half kilometer to over three kilometers across. Connecting these lakes is what appears to be a web of melt rivers, some of which terminate in moulins that core into the glacier’s heart, delivering warm melt water the frigid ice’s center and base. The general bluish color of this region indicates a very high degree of melt with puddles and pools below the 250 meter resolution of this particular satellite shot lending an azure tint to the ice. 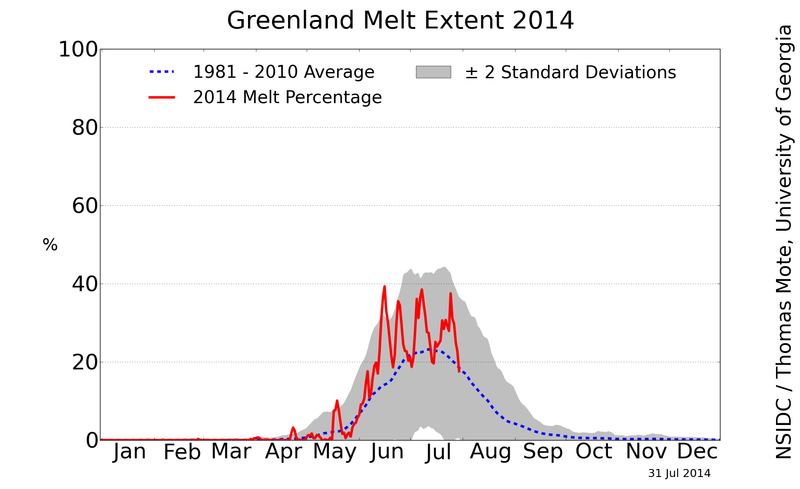 Over the past two decades, Greenland has shown a very disturbing and rapid melt response to human-caused warming. 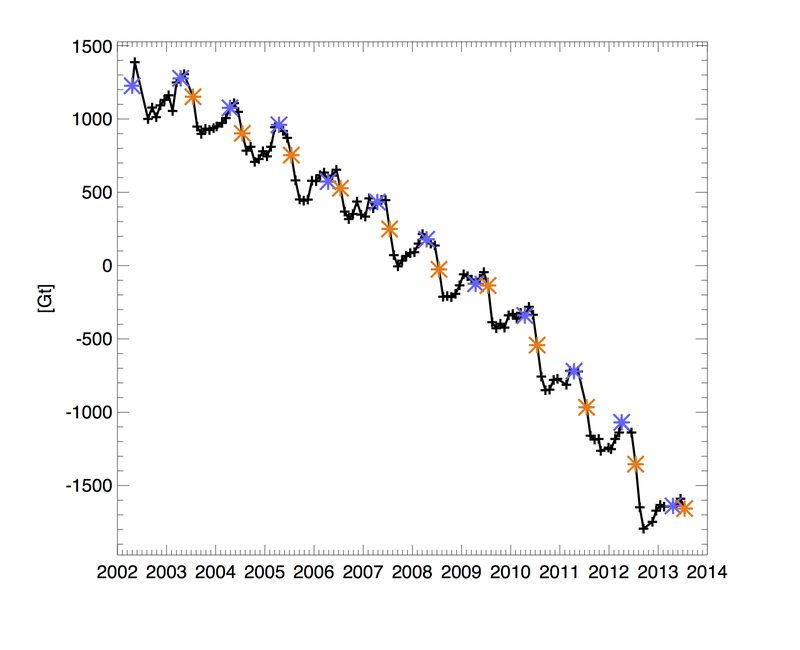 During the mid 1990s, Greenland began to show a net loss of ice mass. Through the 2000s, this melt rate accelerated, growing generally, but rapidly peaking in rather disturbing melt surges as warm weather conditions grew more extreme during certain years. By 2012, a very extreme melt year had occurred, resulting in ice sheet losses on the order of 700 cubic kilometers in just one year. 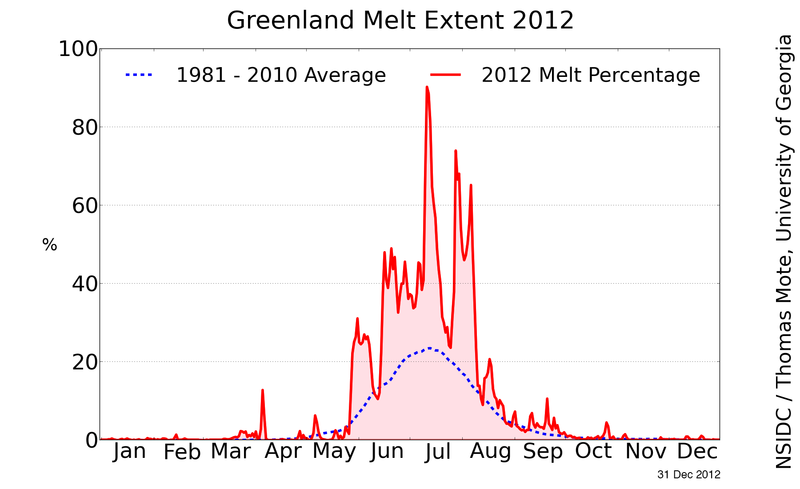 These peak melt years appeared to re-cur at a rate of once every 2-5 years even as overall average melt from Greenland grew to a disturbing 500 cubic kilometers by the early 2010s. Even worse, sensors deep within the ice sheet indicated that the ice sheet had become more mobile, increasing in velocity by about 2-3 percent each year since 2010. 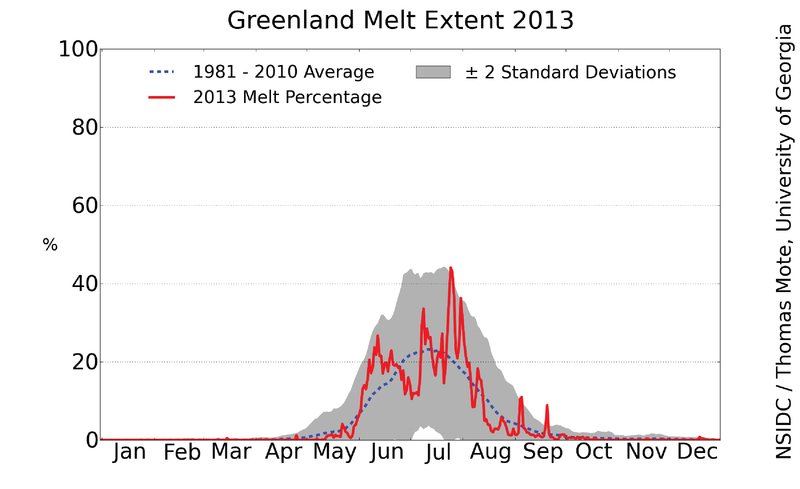 Though 2013 does not appear to be a peak melt year, as weather conditions have favored less melt than in 2012, the continued softening of the Greenland ice sheet remains a very disturbing summer feature. This year’s west coast melt has been particularly dramatic, with the most recent shots shown above featuring some of the worst melts I have yet witnessed.